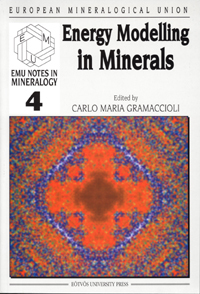 The present book shows the arguments which have been considered in the EMU School (No.4), dealing with Energy Modelling in Minerals; these arguments have been selected in order to provide examples of application of the most advanced theories to several cases. It should be pointed out that although the ultimate solution of our problems should involve "ab initio" quantum-mechanical calculations, at present such sophisticated procedures are far from being routine. Therefore, although "ab initio" approaches will play an ever-increasing role in the future and some important and most recent examples of such approaches are illustrated here, the greatest part of the contributions is dealing with empirical atom-atom calculations. Remarkably enough, such "semi-empirical" applications are often quite successful, providing excellent (or comparatively excellent) results in spite of their more or less approximate nature. It often happens that the methods here illustrated are some steps ahead of the current level of empirical treatment, thereby indicating a possible way of improvement by figuring out routines to be adopted in practice. If some methods seem to be too speculative to be actually usable, here they also are shown, in view of their possible discussion, or just to indicate a way to obtain promising developments. Among the descriptions of practical methods and results, some purely theoretical arguments have been inserted; these arguments - although abstract - according to our opinion are fundamental for earth scientists. Owing to the present status of the art, in a number of arguments there is no unique opinion with respect to their theoretical treatment as it is explained by different authors. Instead of having all of them discarded except the one which looks to be the most appropriate to the Editor (who might sometimes be personally involved in the question), most of such controversial points have been left just as they are, in the original draft of their advocates. Accordingly, the reader might find some discrepancies between some articles and others, which may lead to some obscurity; there are, however, several good reasons in favour of our behaviour. First of all, with a few exceptions we apologize about, our attention in inviting the contributors has been extended to all the principal authors in the world, with no limitation to a group of particular friends; moreover, the presence of different opinions in the context might give rise to interesting debates and critical objections; a further point is that the validity of the different treatments is shown per se by either the level of the theory and most of all by the agreement with the corresponding experimental data. Since we have to do with an advanced school, and in line with what should be a scientific procedure, it is important to provide the user with the possibility of choosing what seems to be the most appropriate method among a number of selected possibilities, rather than yielding to the assertion that something is indeed the ultimate and unquestionable "truth". i-xii + 425 pages. ISBN 963 463 5660.